We’ve been very busy this month. In my last post, I said I would get some pictures of snow… well, then it melted. But on Thanksgiving, which was a couple days ago, we got about 4-5 inches. So we have snow again. Here is Nova. We got her about a month ago, from our coworker. Nova was her son’s dog, when he was in the Air force in Georgia. Now he moved back to town and is going to college, and couldn’t keep her, and my coworker felt bad that Nova was home alone during the day. So we took her in. She gets along great with our other dogs and she is a sweetheart. The three dogs on the back porch. Nova likes to eat snow. The chickens aren’t minding the snow so much. I have heat lamps in the two rooms of their coop, so they can go in and warm up their feet if they get cold. Our batch last year (which we still have the hens from) didn’t like to go out in the snow. I’m not sure why they don’t mind this year, but they don’t. The chickens don’t seem to mind the snow at all. Snow chickens. The dirt spot here is where we took away their old roost that was out there. 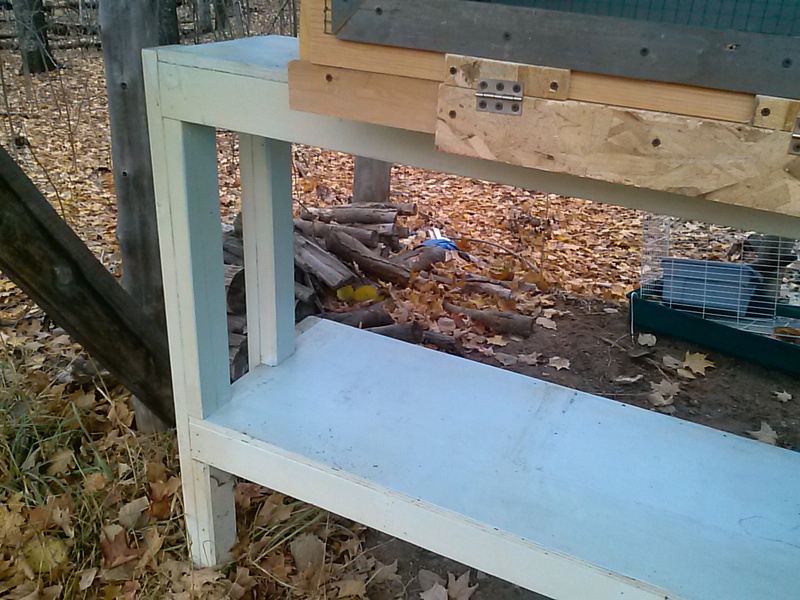 We had to steal the sawhorses that held it up, for the rabbit hutch, which you will see below. Yesterday they found the dirt spot, and they were taking dirt baths in it. The ground is not frozen yet, luckily. Rabbit row. 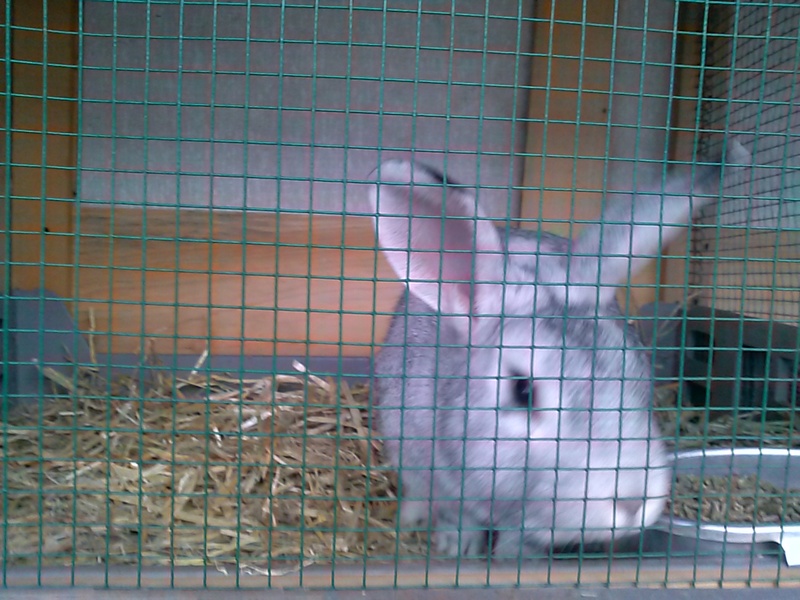 On the left are the rabbits in the hutch we built, and on the right is the one that came with the bunnies. We’re getting it set up for the baby bunnies when they get bigger. The garbage bags in the picture are straw and hay – I have them outside, but covered for easy access. 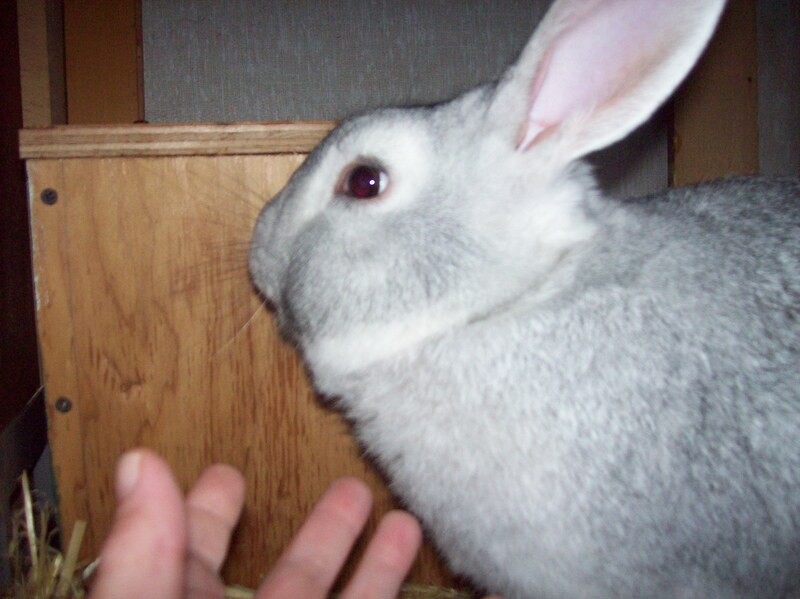 Here is the hutch that came with the rabbits. It had a roof which we removed in order to get it in the back of the truck. We are just planning on using one side for the winter, so we have closed that side in with wood. The inside of the new (old) hutch. It has a wire bottom, but I will cover it with straw to try to keep the babies’ feet more comfortable. I need to look it up, but I believe it will be a couple more weeks before they go in there. Hopefully we’ll get the snow out of there before then. We brushed what we could out, but it may melt a little too. They are starting to munch on food – this one is eating hay. Here they are – they are all brown. 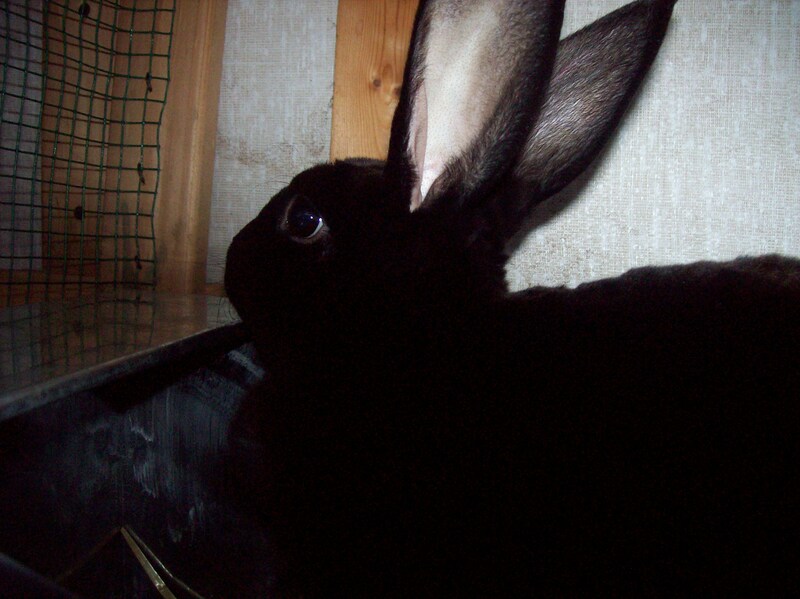 But some are darker brown, and one has a little lighter fur. I’m assuming they change color as they get older, but I could be wrong. I’m still new at this. The mom is black and the dad is gray, so I don’t know how the brown comes in. They like to pile up on top of each other, outside of the nest box. I think there are 8 of them. I’ve tried to count without taking them all out, and they jump around too much so I have not gotten a good count. I will be able to get an accurate count soon when I need to move them. The rabbits have been doing ok with the cold so far. We’re going to add a tarp to the front of the hutches to block wind from the inside. 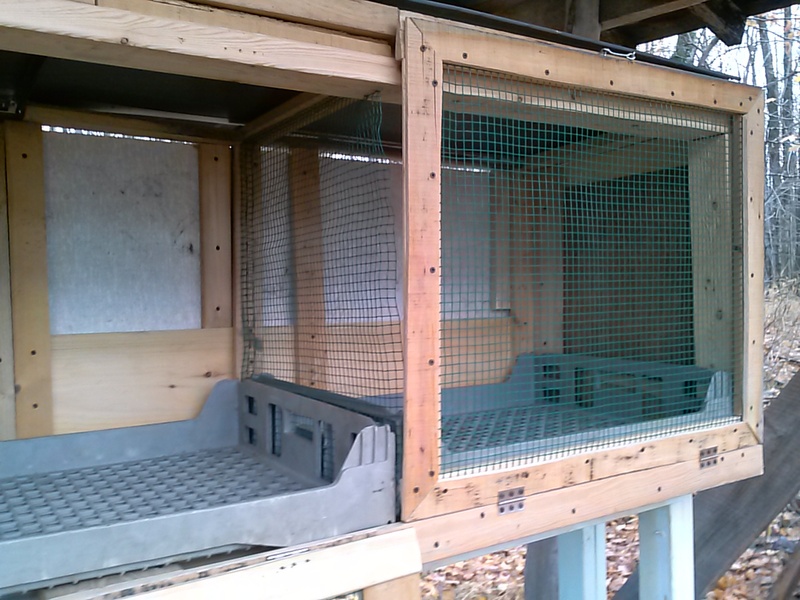 That’s one reason I positioned the hutches into “Rabbit Row.” – I figure it will help block wind somewhat. 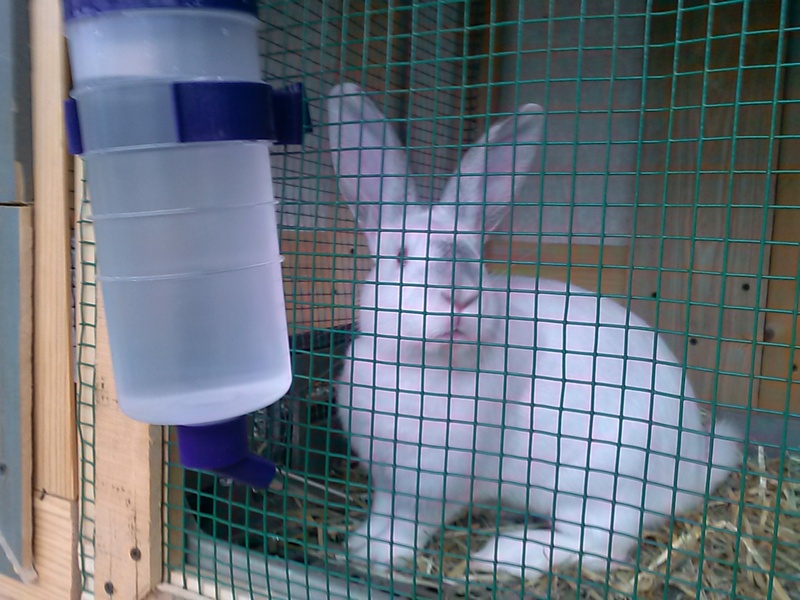 I’m already planning on a new setup once spring comes – more of a rabbit shed, I think. I’d like to add a run of some sort so they can hang out in the grass also. We’ve also decided on names for the adults. They are Earth, Wind, and Fire. (my husband came up with it) – The gray buck is Earth (since he’s on the left), the white doe is Wind, and the black doe is Fire. My husband built nest boxes for the other two rabbits, and they are lined with straw, so they can stay out of the wind when it gets very cold. They like to sit on top of them sometimes, as you can see Wind do here. The farm is pretty much ready for winter. It’s a nice time to just cozy up inside – we don’t have a lot of projects we can do outside in winter, except reinforcing animal housing and doing normal feeding chores each morning and night. I like that it’s kind of a relaxation time. Of course I’m already planning in my head what we’ll do when spring comes. I’m a little late with this post. This November has been a little strange, with warmer temps than normal… that is, until a few days ago. I took some pictures last week, before we got snow, when we were in the 50s temperature wise. The snow started a couple days ago. We only have about an inch on the ground right now. We’ve had some flurries here and there, and now our temperatures are in the 20s. Brrr… Here are some pictures of our pre-snow November. On closer inspection, I realized it’s a white clematis. We have purple clematis growing here, but not nearly this tall – this is up about 8 to 9 feet in the rosebush. And it’s bloomed in November. I haven’t pulled the plants out of the garden yet, and noticed my artichoke plants still looked alive after hard frosts and one day with a dusting of snow. (I have not seen them since we got our current snow). My Brussels sprouts. Update on these – since this picture, we dropped into the 20s. These plants were dead as of yesterday, and the sprouts never got bigger than about dime sized. The plants were completely frozen. I gave them to the chickens, they seemed to like them even though they were frozen. Our yard – all the trees have lost their leaves. 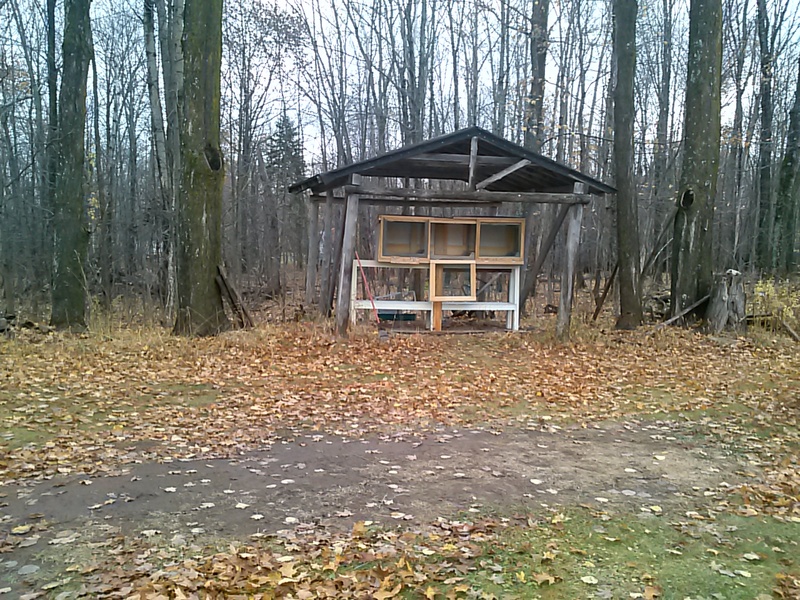 The chicken coop with the leafless forest behind it. The chickens enjoying the sunshine on one of our last nice warmish days. Another pic of the chickens. I’ll get some new pics soon to show you what our snow looks like. 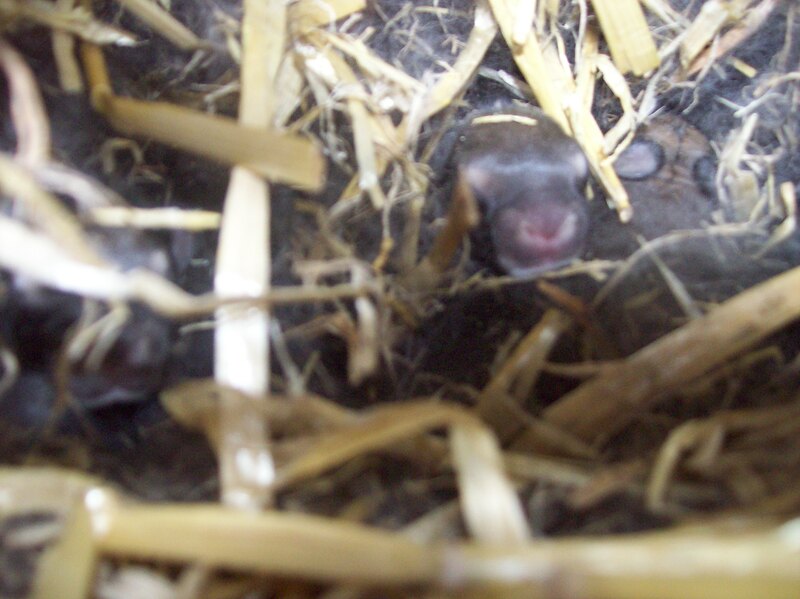 I’ll also update on the baby bunnies – they have grown a lot in 2 weeks. You can see a little face peeking out here. Here’s mama – she didn’t seem to be too upset that I checked out her babies. We gave the other doe and the buck each a nest box as well, just because we thought it may help them keep warm as our weather gets colder. It has been cooling down lately. Yesterday it was very windy and we actually had some snow come down, but the snow melted as it hit the ground. We’re also planning on putting some tarps up around the hutch to block the wind. I think I may wait to mate the rabbits anymore till spring. I don’t think the white doe is pregnant – she was with both the buck and the other doe on the way home, when I was bringing them to my house, but I think they were all too scared to get down to business. I will wait and see though. The Rabbits’ Home is Complete! We started building a hutch last week, and finally finished up this morning. We moved it into its new home, inside our empty wood shed. We’ll find it a better home in the spring, but we thought this would be the best place for it for the winter. Here is our completed Hutch. It is on top of some old fish tank stands my dad made. 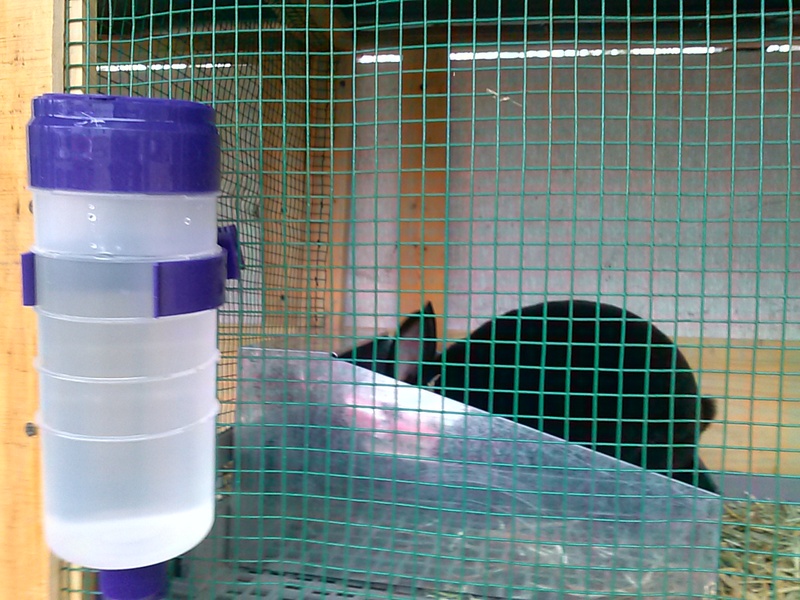 We have three compartments so each of our rabbits has their own space. They are divided by hardware cloth. The floors for each compartment are some bread trays (trays that bread came to our store on, when I was a kid). These were still hanging out in a storage building we own. They slide out for cleaning. 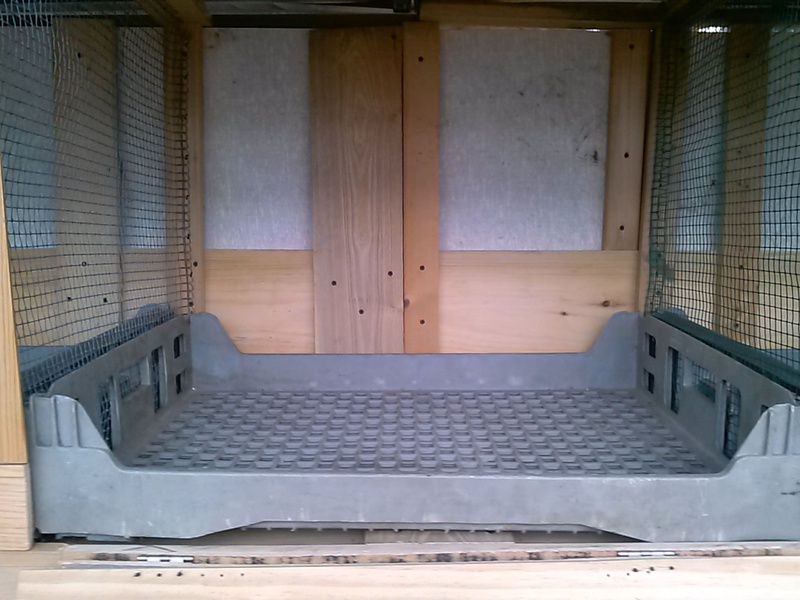 They have holes so that the rabbits’ pee and poo can escape out, but it’s more of a flat floor so it should be more comfortable for their feet than fencing or hardware cloth would be. Here is one of the fish tank stands we have the hutch on. There are shelves underneath, in case we need to put something there. We chose them because they were already built, they were tall enough, and very strong. Here is the view from our side door – we can just look out and make sure everything is ok at night. We have a dimmed light on all the time, and a motion sensor in case predators come in the yard to check them out. Plus our dogs would bark at anything out there. Here the bunnies are enjoying their new abode. 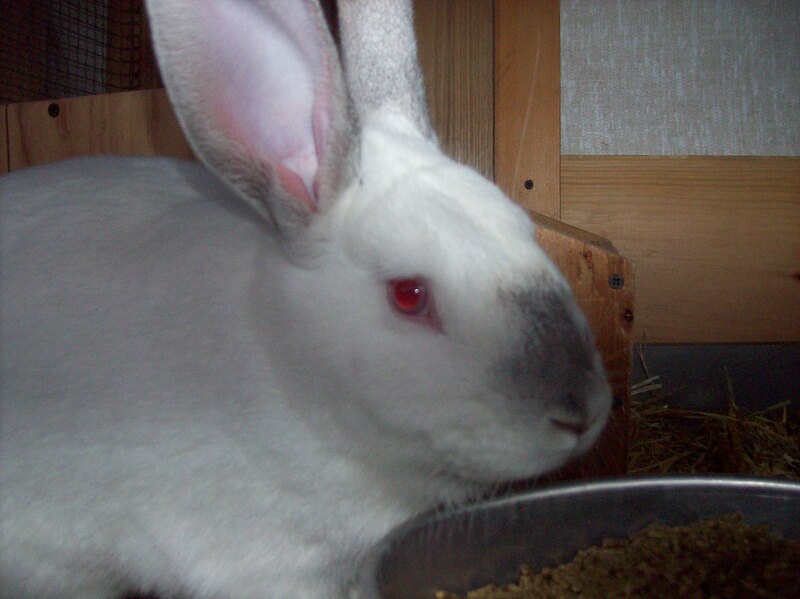 Please forgive the fuzziness of the pictures, I thought they would turn out better but the bunnies move a lot. My buck in his new home. Here is our white doe in her new spot. Here is our black, already pregnant doe, hopefully getting her nest box ready for the babies (due in the next few days). Last time I gave her a nest box she used it as a litter box. We will see how she does with it. So far it’s going well. We are going to make some wooden nest boxes for all three of the rabbits, so that they have somewhere to go to get more warm. The metal nest box I gave to my doe is ok for now, but I worry that it would be too cold in winter. 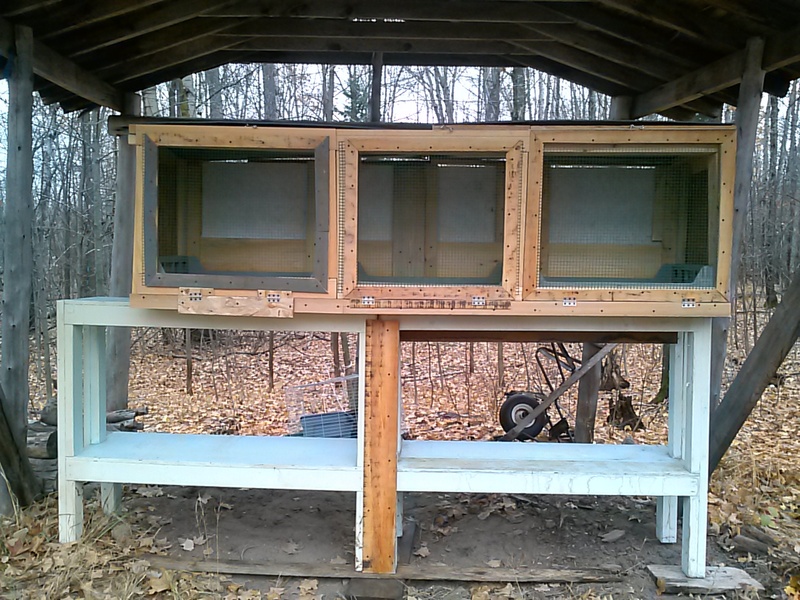 I have the hutch facing the house so that they won’t get as much wind in their cages, but I plan on putting tarp up or something when we get really windy cold days in the winter.